Edward Siirtola founded Siirtola Well Drilling in 1957. 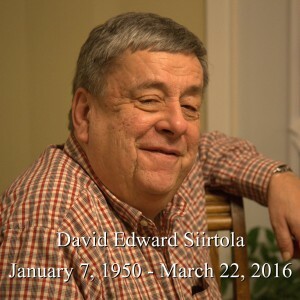 For over thirty years, Siirtola Well & Pump had been owned and operated by his son, David Siirtola, until his untimely death on March 22, 2016. Dave’s wife Lani continues as the owner of Siirtola Well. Siirtola Well continues to operate, offering quality service under the third-generation Siirtolas. While Dave had been active in management until his death, he had long since transitioned the operation of the drill rig and service work to his experienced and licensed crew. Lani and her team have over 50-years combined experience. Scheduled work will continue as planned. We continue to provide quotes for new wells, and we’re happy to respond promptly to your needs for well and pump service. Siirtola Well is licensed by the Department of Public Health and can advise you of the proper well placement in relationship to septic tanks, drain fields, surface water and other wells.